Philadelphia-born Bethany Hogan may be a long way from home, but she has as much passion for London as people who have spent their whole lives here. "I've been working for Team London Bridge for the past year and a half, managing their events and promotions," she explains. "My role on the team involves developing strategies to improve relationships with our community and coming up with creative ways to encourage dialogue and collaboration between members." During her time with Team London Bridge, Bethany has developed a strong understanding of what drives urban development in terms of people (human capital, social interactions and cultural assets), but something was missing. Bethany explains: "I wanted to gain a stronger understanding of the broader factors that come into play in an urban environment such as urban design, planning policy and regulation and how those mix with everyday life." A colleague of Bethany's had already been working with LSBU and had only good things to say about the university, so Bethany began to investigate which courses we offered that could help further her career. 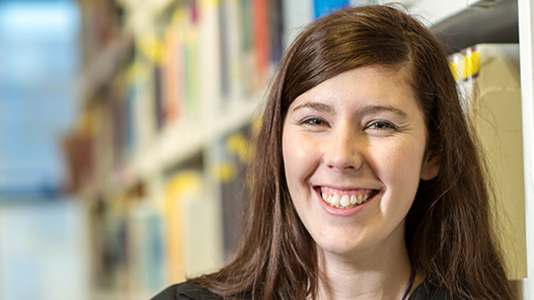 "I originally planned to apply to study the MA Planning, Policy & Practice but was steered toward the MSc Built Environment Studies at an open evening as it would offer a bit more flexibility in the other areas," says Bethany. "It also fits well with my interests as I'm passionate about urban sustainability and I'm really excited about looking at global case studies as well as working alongside like-minded people who are innovating in their own work." As a passionate believer in developing the SE1 area, our location was also a big part of Bethany's decision-making process. What's more, she describes herself as "impressed" by the department's approach to urban development, and feels that it is ideal for her. Like many postgraduate students, funding her studies concerned Bethany. In order to help, she applied for a Vice-Chancellor's Scholarship and was "beyond thrilled" to discover that her application had been successful. "I don't think I could have studied at postgraduate level were it not for the scholarship and for that I'm truly grateful", she says. "I've wanted to pursue this for a long time and am so happy to be able to do it now, especially in an environment that's so encouraging of professionals studying part-time." LSBU awards up to £48,000 in Vice-Chancellor's Scholarships and bursaries to postgraduate students each year. They are made possible by donations to our Annual Fund from alumni and other supporters.